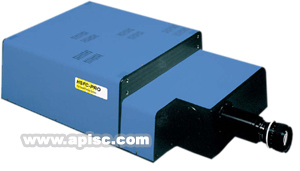 The HSFC-PRO consists of a single optical input,an image splitter to four imaging modules with gateable MCP image intensifiers,and high resolution CCD imaging sensors yielding 8 images at full CCD resolution in Double Exposure modes. Aluminum ball (few mm's size) penetrates a thick steel plate. Spark Gap taken with the HSFC-PRO High Speed Framing Camera. Spark Gap With:8mm taken 20 ns apart @3 ns each.